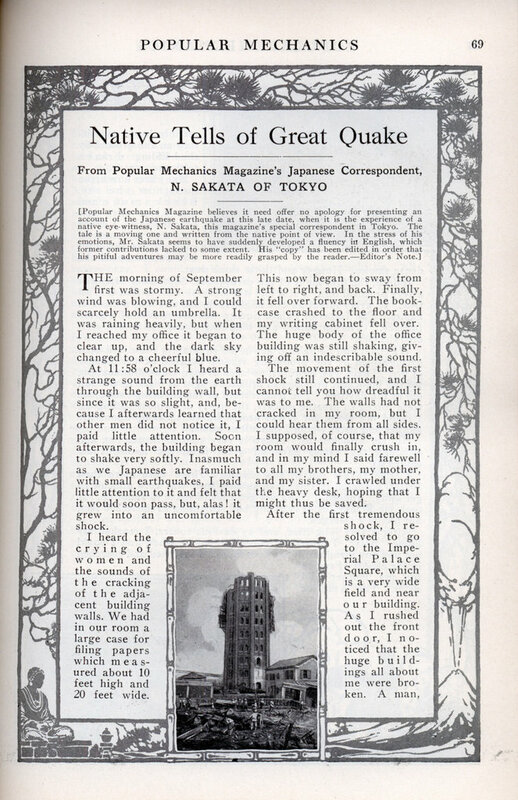 This is an account of the last truly devastating earthquake to hit Japan, the 1923 Great Kanto earthquake. That one was so bad that they considered moving the capitol. 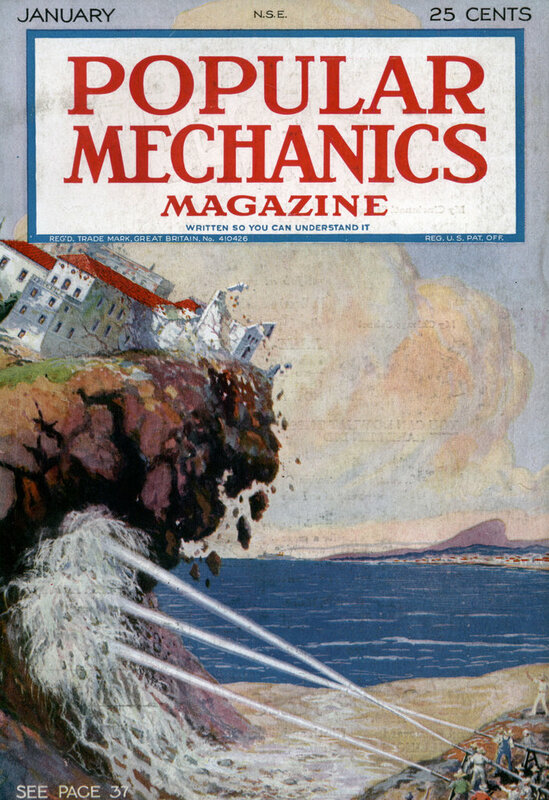 [Popular Mechanics Magazine believes it need offer no apology for presenting an account of the Japanese earthquake at this late date, when it is the experience of a native eye-witness, N. Sakata, this magazine’s special correspondent in Tokyo. The tale is a moving one and written from the native point of view. In the stress of his emotions, Mr. Sakata seems to have suddenly developed a fluency ill English, which former contributions lacked to some extent. His “copy” has been edited in order that his pitiful adventures may be more readily grasped by the reader.—Editor’s Note.] THE morning of September first was stormy. A strong wind was blowing, and I could scarcely hold an umbrella. It was raining heavily, but when I reached my office it began to clear up, and the dark sky changed to a cheerful blue. At 11:58 o’clock I heard a strange sound from the earth through the building wall, but since it was so slight, and, because I afterwards learned that other men did not notice it, I paid little attention. Soon afterwards, the building began to shake very softly. Inasmuch as we Japanese are familiar with small earthquakes, I paid little attention to it and felt that it would soon pass, but, alas! it grew into an uncomfortable shock. I heard the crying of women and the sounds of the cracking of the adjacent building walls. We had in our room a large case for filing papers which measured about 10 feet high and 20 feet wide. This now began to sway from left to right, and back. Finally, it fell over forward. The bookcase crashed to the floor and my writing cabinet fell over. The huge body of the office building was still shaking, giving off an indescribable sound. The movement of the first shock still continued, and I cannot tell you how dreadful it was to me. The walls had not cracked in my room, but I could hear them from all sides. I supposed, of course, that my room would finally crush in, and in my mind I said farewell to all my brothers, my mother, and my sister. I crawled under the heavy desk, hoping that I might thus be saved. After the first tremendous shock, I resolved to go to the Imperial Palace Square, which is a very wide field and near our building. As I rushed out the front door, I noticed that the huge buildings all about me were broken. A man, terribly hurt,, was sitting on the ground by the building. I ran on to the square. Many fires now arose throughout the city. Black smoke and red flames were cast over the sky. I could not see the natural color of the sky anywhere because of the dense smoke. Hunger and thirst came next. Indeed, the first night of the earthquake, September first, was a very dreadful one. I still find it difficult to believe that it is all true. In every direction one might look, the city was a mass of flames. The Imperial Palace Square was the middle of a great furnace. Crimson flames and billowing clouds of smoke covered the city. We could find no light or gas in the square, for these had been extinguished at the producing station because of the danger of fire. There was, however, no need of man-made illumination, for the holocaust provided as brilliant a light at night as the sun did in the daytime. The temperature of the air being raised, we were forced to breathe quickly, the heavy air almost stifling us. I could not sleep, for I was nearly frantic thinking about my mother and sister whom I had left at home. Hunger attacked us. Tokyo is very cold in September, and although the flames gave off great heat, the midnight air chilled us. I tried to get out of the crowds. There were more than 100,000 gathered in this small square, so it was very difficult to get away. Indeed, I could not get a bit of space to stand up. It took me 30 minutes of crawling and stumbling to move 200 feet, but finally I emerged. After a very long time, and by devious routes, I reached my home. Alas! I found my house burned to ashes, and I could not find any members of my household. I searched and searched in the clouds of smoke for my mother and sister. The smoke filled my eves and I could not see. I tried to find even a bit of my mother’s burned body, but I could not. After hours of vain search, my eyesight nearly gone from smoke, I had to stop, and I could only hope that my mother might have escaped to safety somewhere. I could not think of any place she might be. All the homes of my relatives were destroyed. “Oh, where could she be!” I asked myself, and cried and cried. I thought that I might not be able to find them anywhere any more in this world. All my courage had disappeared. It was in this state that, as I was walking along the river which is near my house, I saw a woman dimly through the smoke—just an outline. The phantom shape seemed to resemble my mother. I approached and asked her who she was, and then, I could not believe it was real! I thought it must be a dream, but it was not. It was my mother! It was my mother! She and I embraced each other again and again, thanking God, and again I cried and cried for joy. Coming home from my office I saw hundreds of dead bodies of men and women. I had had nothing to eat for more than three days, and the odd odor of the hot wind often caused me to fall down fainting. But my mother and sister were safe, so my courage had returned to me. Everywhere, I saw thousands of people running to escape from the city to the suburbs. I had taken my mother and sister to the suburbs, and was trying to get into the city. I understood fully that I might be wounded or killed by fire and falling buildings, but we nevertheless kept on our way. Occasionally I was asked who I was by a policeman. They urged me to stay out of the city, and at times even attempted to prevent me, for by this time the government had declared the city under martial law, and soldiers stood 011 the road with their guns loaded and swords bared. If we insisted, then it would mean we would be shot or cut down. Sometimes we were attacked by flames and smoke. Frequently, to protect ourselves against such terrors, we were forced to dash into the water and get ourselves wet from head to foot. It was very dangerous work. The fire continued eight days. We Japanese have one thing in mind to tell you; that is, our great thanks for the wonderful help you gave us. If you will, please, print on your pages that the Japanese people are thanking the American people, and will never forget your kindness at this time. I am now at Shibaura, which is the shipping center on Tokyo Bay. I can see many ships flying the American flag on the calm sea. It is an inspiring sight, and I thank God for it. Life is stranger than fiction: Mr. Sakata says thanks to America for helping in 1923 and that Japan will never forget it. Seventeen years later because of Japan’s bombs America says, “Remember Pearl Harbor”. Japan becomes the only country that America uses the dreadful atomic bombs on. Japan becomes great again by the help of America and Japan’s old WWII foes. Today American’s have great concerns for a tsunami that threatens Hawaii and has already hit Japan. America’s president claims Hawaii as his birth place. As with the great San Francisco earthquake early in the 20th century, more people were killed by fire than by the earthquake itself. Speaking of earthquakes … condolences to the people of Japan that were hit with the 8.9 earthquake on March 11th . Yes, condolences to Japan, history, or at least geology does have a tendency to repeat itself.